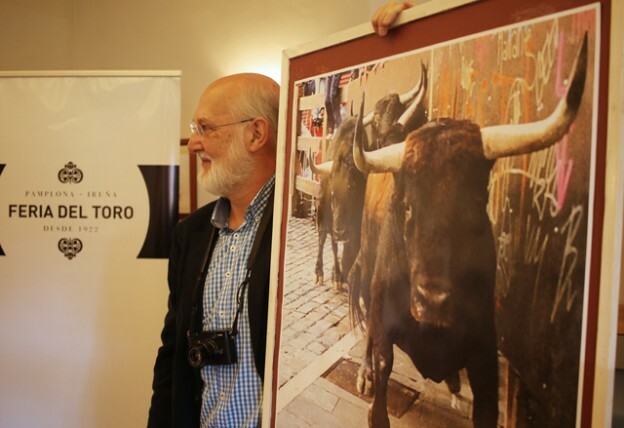 The entity responsible for organizing the Sanfermin Bullfighting Week – the Casa de Misericordia de Pamplona – commissioned Pio Guerendiáin to create the official poster for this year’s Feria del Toro de 2016. The poster is based on a photographic image taken from the corner of Estafeta where Guerendiáin used to own a small store. The typography has been made by architect, Fernando Redón, one of the creators of the first official Feria del Toro poster which had an image of the Running of the Bulls on the streets. Guerendiáin is a well-known photographer from Navarra with a wide portfolio and one who has received international recognition in different fields. He is especially remembered for his photographic work in the Sanfermin Running of the Bulls where he used to take photos from behind a flap which was cut out on the wooden protection sheets that covered the windows of his store. The image that he has used for the poster comes from a larger photo taken on the 12th of July, 2012. In the image of the poster we can appreciate the grain-type coming from the ISO sensitivity 3200 of the snapshot and the maneuver of the artist with the diaphragm (5.6) so as to maintain the greater part of the photo focused (depth of scope) without losing the speed that was necessary to capture the bulls under the awkward lighting conditions. After the presentation to the press, Pío Guerendiáin complied with the tradition of sticking up the poster to announce the Bullfight Week in the Bar Miami in Pamplona, located in San Fermín Street. Here too, Pío met Paloma, the new owner of this establishment, as well as Manuel Sagüés, the bullfighting critic from the Diario de Noticias newspaper. Paloma, del Bar Miami, y Pío Guerendiáin. To see some of the photographic work of Pío Guerendiáin taken from behind his “wooden flap” you can find it in this article from Sanfermin.com and also appreciate some of the best images of the bullrunning taken at this corner.